The first of our festivals is the Holiday of Passover in which God showed His might in Egypt for the sake of His preferred people. We were lowly slaves in the land of Egypt and our enslavers were desirous of destroying our existence as a Nation. The Almighty did not forget His promise to Abraham and with his great power, redeemed us from our slavery in Egypt. The observance of this Holiday has many aspects which are very well-known. The first of which is to recite the HAGGADAH, in which we tell the story of our miraculous delivery from Egypt to our children in order to establish for all generations to come the basis of our faith in God, and the reason of our existence as a free people. Only "Kosher for Passover" foods and beverages may be consumed or even present in our households. As we came out of Egypt some 3,400 years ago, the sun of freedom broke out and shined upon us. It was truly the miracle of all time. The Talmud states that "in the month of Nissan we were redeemed and we will once again be redeemed in this same month." May the Almighty hasten that day. Passover, the Festival of Massot, begins on 15 Nissan. 1938 and 1939 Hazzanut Notes of H Moshe Ashear for Shabbat Haghadol. 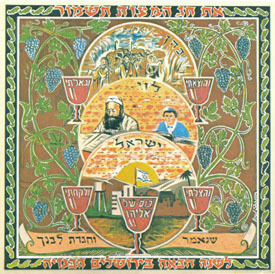 Pizmonim for Passover according to Sassoon Manuscript #647, Aleppo, circa 1850. Haggadah 2304 H40 מן יעלם ומן ידרי Arabic.